Specialist Frank Masiello is reflected in his screen on the floor of the New York Stock Exchange, Aug. 24, 2015. Worries about China's faltering economic growth pushed down stock and oil prices around the world on Monday. U.S. stock markets plunged at the open, with the Dow off nearly 5 percent in the first few minutes of trading. After a day of wild swings in stock prices, U.S. indexes were down 3.6 percent or more at the close of trading. In Asia, Shanghai's stock index plunged more than 8 percent, Japan's main market lost more than 4 percent and Hong Kong was down more than 5 percent. 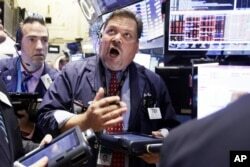 Key European indexes were off 4 percent or more. India's Sensex dropped 5 percent, its steepest drop in six years. Prices for many commodities also declined, with the price of crude oil off by more than 4 percent to hit the lowest price in more than six years. White House spokesman Josh Earnest said Monday that President Obama is confident in the strength and resilience of the U.S. economy. He urged China to move toward reforms, including a market-determined exchange rate system and more transparent economy. Some investors were disappointed that China's government had not taken fresh steps to ease the stock market losses. Analysts warn the market volatility is set to continue in the days ahead, with trillions of dollars already wiped off global share markets since China reduced the value of its currency, the yuan. The Wall Street Journal reports investors are disappointed that China's government had not taken fresh steps to ease the stock market losses. 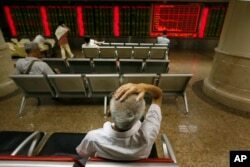 Monday marked the seventh straight day of losses on key Asia-Pacific market indices, down almost 5 percent, the most since 2011. Singapore-based Daniel Martin, senior Asia economist for research firm Capital Markets, says China's economy is more stable than many investors realize. Chinese investors monitor stock prices at a brokerage house in Beijing, Aug. 24, 2015. The current plunge in global stock prices follows six years of mostly rising stock values, which Wall Street calls a "Bull Market." Experts say market downturns are a normal part of the economy, with abrupt 10 percent drops, called "corrections," hitting every few years. Joshua Brockwell of Azzad Asset Management says the correction may worry investors, but it's a healthy change for the economy that helps keep stock prices from getting too inflated. The last such drop in the United States was several years ago, making some experts say this one was overdue. These corrections typically last a few months, but are considered impossible to predict. Some investors are expressing concern that the actual economic situation in China may be even worse than official statistics portray. Uncertainty worries investors, and frightened investors stop buying and start selling to avoid more losses. Trader John Santiago, center, works on the floor of the New York Stock Exchange, Aug. 24, 2015. Stock markets are often a balance between fear and greed. Greed makes investors willing to risk their money with the purchase of a stock, which is ownership of a fraction of a company. If the company prospers, due to good products and management, then investors also benefit. But if the firm makes mistakes or runs into economic chaos, then the value of the company falls and investors suffer. That is why faltering growth in a huge market like China concerns investors around the world. It is also why, eventually, market downturns end. When the price of stocks drops low enough, investors calculate they can get a bargain and make money if they take a chance on a certain stock. As more and more bargain hunters hit markets, prices are likely to eventually recover. Monday’s stock market chaos prompted some analysts to wonder if the Federal Reserve would still make a widely expected increase in interest rates in September or later this year. The National Association for Business Economics just finished a survey of hundreds of its members, who help run companies across the nation. Most of them expect the U.S. central bank to raise interest rates this year, perhaps as soon as September. While the survey was taken before the latest stock market turmoil, NABE spokesman Ken Simonson says he has not yet seen evidence that the rate hike will be put off. He urges investors to keep their perspective. Simonson, an expert on the U.S housing market, says construction is one of many areas of strength in the U.S. economy.